That's a pretty common side effect of lots of feedback. More than 100 is really not necessary. But it really depends on the design. More stages = more feedback to get all the stages to act nicely. Those Crown amps have a ton of feedback and that's bad juju. Sure if pretty....glad you're enjoying it. i've got the question out about the high damping factor negative feedback thing. here is the answer to your questions about the high damping factor and negative feedback. The damping factor is a calculated value of the engineering design. The calculation may differ from one to another manufacturer. The THD+N 0.006% was measured using A-Weighting method whereby the measurement naturally lowered (favorable to the readers?). In Srajan review, the published AP report shows THD+N at 0.02321%. This is direct measurement without A-Weighting filter in the Audio Precision machine. This tells us that there is no large local/global feedback. EX-M1 uses a relatively small feedback loop at stage one amplification. Kinki Studio chief Mr. Liu comment was, large local/global feedback loop is undesirable as the sound will be muffled or overly smoothen - this is definitely not Kinki Studio house sound. My reply previously to a guy. I'll stop pickin' at this after one more comment. It's hard to reconcile the very low THD levels and high DF (i.e., low output impedance) reported for these amps with the notion of very limited amounts of feedback... although low feedback is compatible with early comments on these amps of very high levels of gain. the new gain switch on the does come in handy, as when I first turned the amp on and played music the amp was set on high gain. at 12 the volume was as loud as I like to listen. putting it on low gain 40 was loud but still lower than the high gain setting of 12. 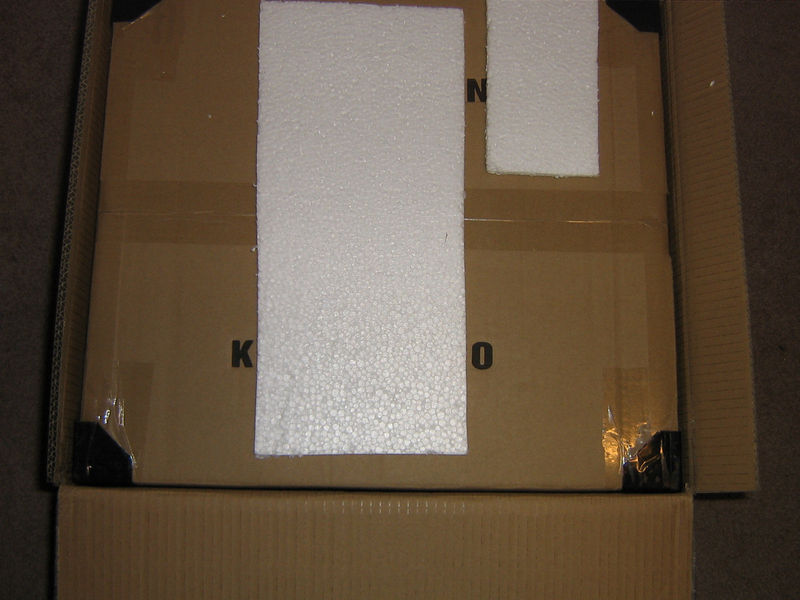 I can SEE why the DHL guy didn't want to bring the box into your house for you. 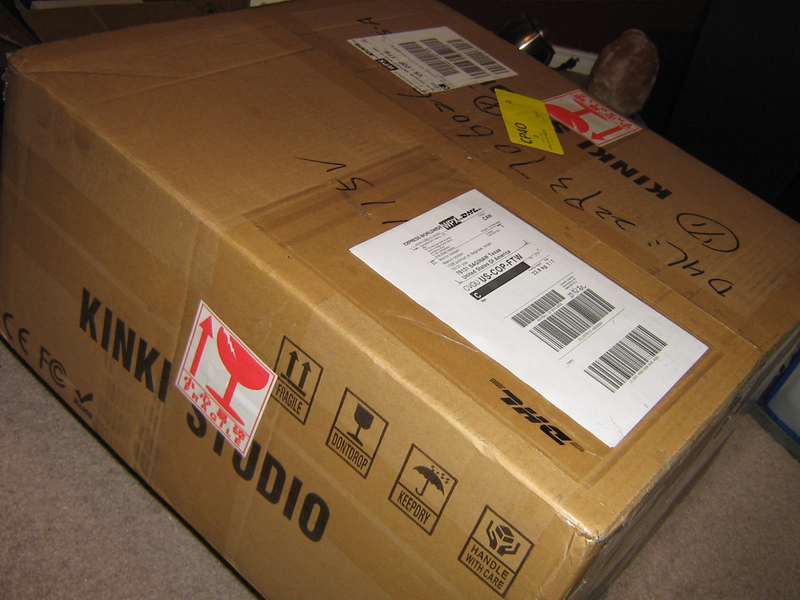 With KINKI STUDIO in big letters on the side he probably thought you had some crazy $EX stuff in there! Nice Marv, don't worry too much about the DF, or global feedback. If it sounds good to you, meshes well with it's playmates, that's all that matters. Congrats on the new toy. That faceplate though, makes my eyes go buggy. i mentioned to them that you can't read the name from your chair and suggested to back light it or paint it with a metallic paint. how about red or gloss black. Always liked integrateds, but only owned 1 way back in the early 80's; it was a Pioneer A-9, and sadly it actually went up in smoke one day. I really like intergrateds also. I have an Anthem that is great. This Kinki is interesting. i started out with kenwood integrateds. i was listening to a jazz cut that started out with a sax solo and in between notes and breath breaks i could hear this sort of reverb harmonics lowly in the background. i was sitting there trying to figure out what it was, then a piano and drums joined in. it was the sax causing the strings of the piano to vibrate and create harmonic overtones to the tunes of the sax. this amp is pulling in some weird (nice) stuff. 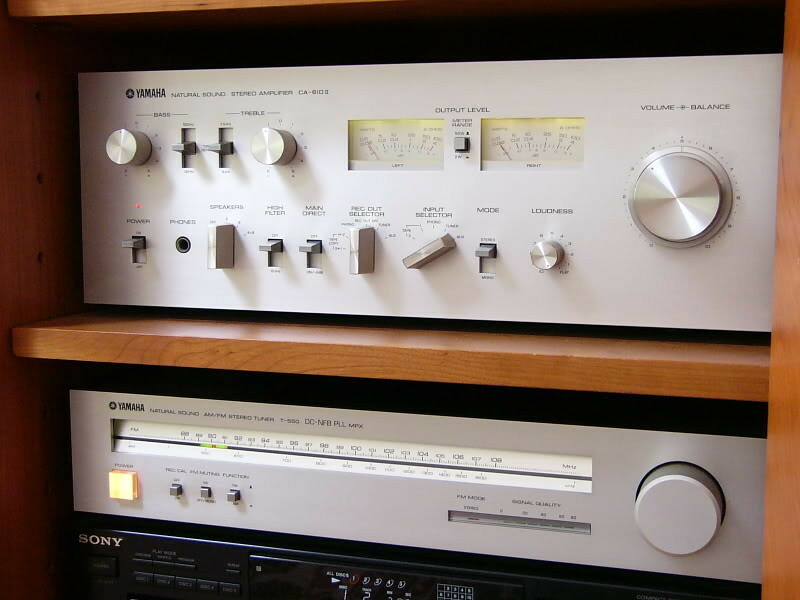 I long felt that the best bang for buck was to be found in integrated amplifiers -- especially when I was severely finance constrained. FWIW, I started with one, too, of which I am still quite fond (although, I'm sure, not strictly objectively). That video was something good to watch for sure. I know being there would be the best way to judge. The Kinki seemed like a great power amp pushing what was fed to it. It seemed to be a great match for his components and speakers for sure. 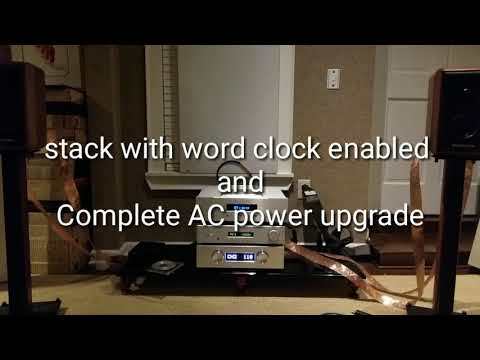 I loved how much better the sound, sounded when he used the clock in the CD player instead of the one in the DAC. I heard the sound IMPROVE! Also, that magnetic plug thing did affect the sound in a negative way for sure. So that sure tells me, power from the outlet itself , CAN change a stereo's sound. I was a skeptic but still believed all the people WITH EXPERIENCE that you do, or can get improvement of sound ( that comes out of speakers way down the chain ) from upgrading a power cable sometimes. That was very cool to watch! That’s a lot of DF. light dusting and I use this company for covers. Price seems to be climbing based on demand. Website shows it at $2,898 today and they claim a 3-4 week shipping delay. Looking for something interesting to give my son to upgrade his system. 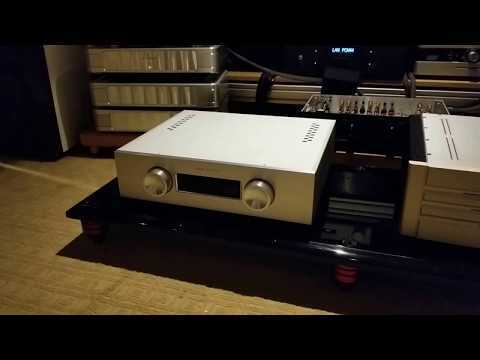 The Parasound A21 at $2,495 for his modded out 3.1's is at the top of my list right now. Replacing his Emotiva PT-100 with a Carver C-1 I just finished rebuilding from the ground up so not so sold in the integrated aspect. Ahh, missed that little detail. Thanks for pointing this out. Now it's looking a whole lot more attractive for sure. That Amp is absolutely beautiful, Congrats! Wobbly knobs right out of the box? S/N is just over the wire. I'll be interested to hear what you hear. the money goes into the interconnects. Muting? Clipping protection, overheating protection? Clean layout. Could it benefit from isolating the amps? Sensitivity? How does it sound with various components? All this stuff you're asking for costs money. This amp is about sound. Find an amp with all the features you mention and let me know how much it costs. I don't find my knobs wobbly, you don't use the knobs with the remote in hand. It's not personal, it audio. Please forgive me if it was taken that way. I'm just suggesting options the potential buyer might consider. This amp reads like an amp for tough to drive speakers or floorstanders.